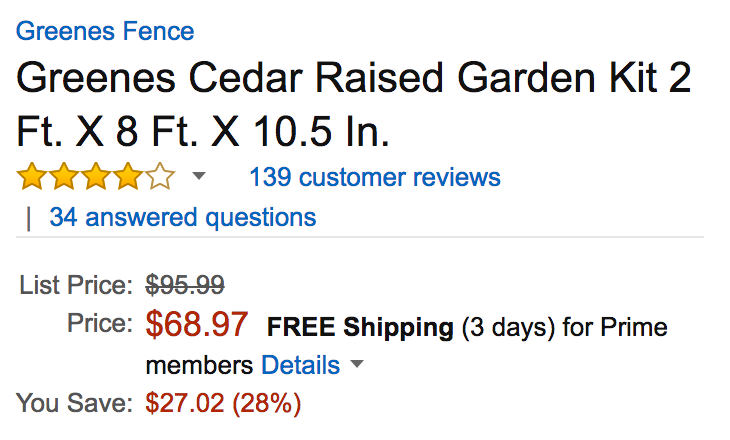 Amazon offers the Greenes Cedar Raised Garden Kit 2 x 8-foot x 10-inches for $68.97 shipped. For comparison, it goes for as much as $85 online at retailers like Home Depot. Today’s deal is an Amazon all-time low. Rated 4.1/5 stars. Made from USA-sourced cedar wood that is 100% chemical free. The 2 ft. x 8 ft. x 10.5 in. Cedar Raised Garden Bed lets you grow your all your favorite plants, vegetables and herbs. Assembling this kit is a simple: simply slide the boards into the corner posts to form your frame, attach the caps and add your soil and plants. You won’t find an easier way to create the garden of your dreams.